It’s December, which means there is only one bit of suspense left: who will play either the Patriots or Steelers (probably the Patriots) in Super Bowl LII? Thank goodness for the NFC, because that’s where all the drama and suspense remains in 2017. The AFC is a foregone conclusion, but that doesn’t mean we can’t have fun with what the NFC has to offer. And it’s plenty good, with the Philadelphia Eagles pulling a worst-to-first in the NFC East to be 10-1, the Vikings at 9-2 hoping for a chance at hosting the Super Bowl, and the 8-3 Rams and Saints in the mix too. That’s not to mention a number of wild card hopefuls, like the 8-3 Panthers, 7-4 Falcons and Seahawks, and the 6-5 Lions. It’s all good as always in that conference. The Broncos are seriously favored on the road? 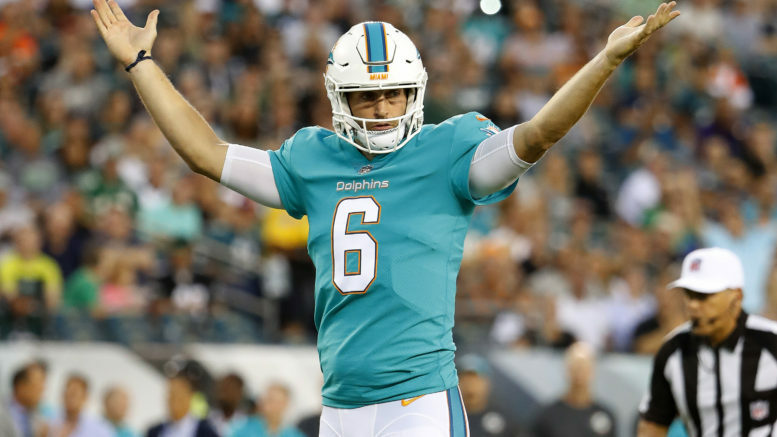 I know the Dolphins are awful, but with Jay Cutler back and facing his old team, they can’t lose at home to a Denver team that has literally mailed in every game since a 3-1 start. In a battle of completely lost teams in the middle of dreadful seasons, go with the slighty-less-awful home team. Pick: Dolphins. Speaking of mailing it in, that’s what the Chiefs have done. They were so terrified of the Steelers, they not only lost that game when they were 5-0, but they’ve let it ruin their season. The Chargers and Raiders are just one game out of first in the AFC West because the Chiefs realized that they’re, well, the Chiefs. The Jets have played hard every week and had a chance to beat a very good Carolina team last week. The Chiefs are back in the Meadowlands two weeks after losing to the 1-8 Giants and not scoring a single touchdown. Never bet the Chiefs, especially as a road favorite, until they prove that they’re not the 4-12 team I predicted them to be before the season. Pick: Jets. The Texans won the first meeting, 57-14, with DeShaun Watson under center. They are out of the race now, but the Titans have been not exactly put the hammer down against the teams they should beat, having to squeak out wins against Baltimore, Cincinnati, and Indianapolis. Pick Houston to keep it close, even on a short week on the road. Pick: Texans. Too bad the Packers had to shoot themselves in the foot Sunday night, because they played valiantly enough to beat the heavily-favored Steelers in Pittsburgh. Don’t count on the Packers, even with Brett Hundley under center, to lay two straight eggs at home. Jameis Winston is back for the Bucs, but that may actually be a bad thing after Ryan Fitzpatrick held his own the past few weeks. Pick: Packers. I hope I’m wrong about picking the Falcons here, I really do. This Vikings team has moxie, a word that does not exist in the Atlanta sports vocabulary. The Falcons actually almost choked again last week, letting the Bucs go from down 21 to just seven and drive deep before Atlanta closed it out. This is a football team that is flat-out scared in big moments, but the fear here is that they are picking up steam and the Vikings are simply due for a letdown after Case Keenum’s magical, Player-of-the-Month November. If Atlanta gets into the postseason, well, it’s a shame, because much like the Chiefs in the AFC, they are pretty much just wasting a spot for someone who can do more damage. Pick: Falcons. What a mistake by Ben McAdoo, a lame duck coach, to bench Eli Manning for no real reason. The Giants have stopped playing hard, and the Raiders are very much in the hunt at 5-6. They can’t get any interceptions on defense, but then again they haven’t faced Geno Smith. Expect this end-of-the-Eli-era to get messy, fast. Pick: Raiders. Any team that can beat New England on the road — not to mention Detroit the following week — gets my vote as a legitimate contender (unless the QB/coach duo is Alex Smith/Andy Reid). The Panthers weren’t exactly sharp in beating the Jets last week, but found a way. The Saints are running the ball and running it well, but you have to figure this one will be closer than the 34-13 blowout win New Orleans had in Carolina in Week 3. Expect a shootout that comes down to the wire. Pick: Panthers. The Bears are not only due for a win, they’re actually due for a win against a bad team. All three of their wins have come against playoff contenders in the Steelers, Ravens, and Panthers, while the 1-10 49ers only beat the equally-woeful Giants. Jimmy Garropolo is finally getting the nod, but it will be a steep learning curve him on a bad football team. Go with the Bears, despite a mediocre offense and a lame-duck head coach. Pick: Bears. Could the Rams possibly do any better against Arizona than they did in late October in London? They knocked Carson Palmer out for good in a 33-0 win in London, but the Cards are coming off a surprising home win under Blaine Gabbert against a playoff contender in the Jags. Can the Rams keep up the intensity after a huge win against the Saints? The odds are L.A. can get to 9-3, but it won’t come easy against a desperate Cards team. Pick: Cardinals. Be the first to comment on "NFL Week 13 Picks: Thank Goodness For the NFC"